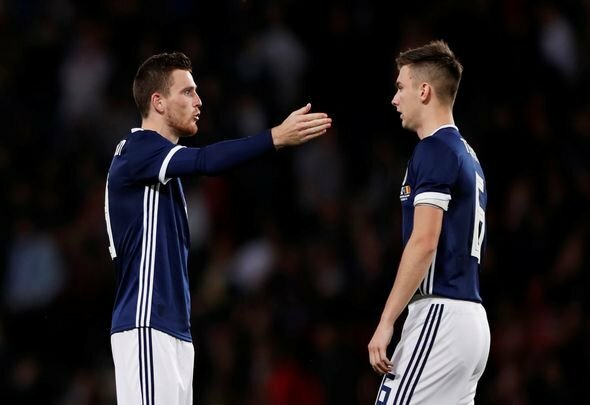 Kenny Miller compared Celtic defender Kieran Tierney with Liverpool defender Andy Robertson and shared that he thought they were very similar players. The 38-year-old heaped praised on the Hoops’ 21-year-old left-back for his attacking ability before comparing him with the Reds’ Robertson in order to share that Scotland manager Alex McLeish had a problem if it came to choosing between them. McLeish opted to play both Robertson and Tierney during Scotland’s 2-1 defeat to Israel on Thursday night and Miller shared that the international boss had picked the best system possible in order to accommodate both left-backs. “I think you have to have both in the team, I think it’s about finding the best possible way, I actually agree that is the best system to fit them both in or does he make the big decision and play a back four and leave one of them out,” said Miller on Sky Sports News ahead of playing Portugal on Sunday (Sunday October 14, 13:31). “It’s too easy just to say to field two left-backs you play one forward and one behind, it’s a completely different position. “You see Kieran Tierney for Celtic always coming forward, facing forward, he’s great when he gets in that final third, opposite his opposing full-back, his cut-backs and crosses across the goal. Robertson and Tierney should get used to being compared as the compatriots are clearly their nation’s best players as it stands. The only issue with that is that they are both left-backs and McLeish has a dilemma using both of them and seeing the duo succeed. Miller is spot-on to point out that playing left-back is a completely different ball game to being asked to play as a left-sided midfielder or winger. However both Robertson and Tierney have showed for their respective clubs that they are great attacking threats so hopefully McLeish can find away to see the duo play well alongside each other. Robertson, who earns £50,000-a-week (Source: Spotrac), seems likely to have the edge on Tierney if McLeish ends up having to axe one of the talented left-backs from his starting line-ups, simply because the manager opted to make him captain. It would be odd if after handing him that huge honour, that he drops the Liverpool defender to the bench. Hopefully this scenario doesn’t develop as Tierney deserves to be playing international football on a regular basis.